Poor Attic Ventilation Can Ruin Your Insulation, Destroy Your Shingles, And Raise Your Energy Bills! Proper attic ventilation systems allow a continual flow of outside air through the attic, protecting the efficiency of the insulation and helping to lower temperatures in the living space. Not only is poor attic ventilation a health hazard for families living in warm client zones, like Solano county, proper attic ventilation is also recommended by the U.S. FHA. It is estimated that 9 out of 10 homes in North America do not have proper attic ventilation. Why? Because most people are unaware that attic ventilation can impact the durability of their entire home. In the summer, improper ventilation can cause attic heat to build in excess of 160°F. This highly-heated air eventually permeates the ceiling insulation into the living area below. Is your roof properly ventilated? Give us a call today for a free analysis to determine your roof's ventilation requirements. How are your roof shingles performing? Warm weather days are here, and It's time for a proper roof inspection. Shingles installed in the fall, winter, or early spring may not heat up enough to activate the seal-down strip properly. Shingles installed in cold weather may have dust, dirt, leaves, and debris accumulating under the tabs and on the seal-down strips for months and may never seal properly even after warm weather arrives. Homeowners residing in Vacaville or surrounding Solano County will experience windy days this Spring, so nail placement and replacement may be necessary. Give the experts at Above All Roofing a call for a free roof inspection. Considering a new look for your roof this summer? 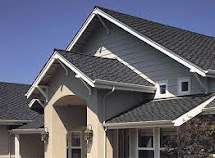 Call Above All Roofing and ask about shifting to tile roofing.